Welcome! 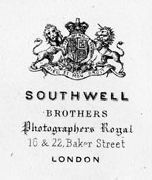 This site is designed to showcase our family collection of cartes-de-visite, photographs taken by the Southwell Brothers at their studios 16 and 22, Baker Street, Portman Square and 64A, New Bond Street, London in the 1860s and 70s – a collaborative project undertaken by several branches of Southwell descendants. We have grouped our collection of images into several categories; royalty, theatrical, the establishment and others, and these can be accessed via the links on the left of this page. We have also included examples there of back stamps for various dates which enables the date of any newly discovered carte de visite to be identified to within a narrow range of years. The National Portrait Gallery in London has recently (9 May 2011 to 6 December 2011) held a special display entitled "The Southwell Brothers: Photographers Royal". See the What's On section of their website for more information. The photographic catalogue of The Royal Collection Trust lists more than seventy photographic portraits of members of the Royal family by William Southwell, dated 1860–1862, and Southwell Brothers, dated 1862–65. Images of many of these examples may be seen on the Trust’s website. The Victoria and Albert Museum possesses a large number of Southwell Brothers photographs in the Guy Little Theatrical Collection. Many of these may be seen on the Museum's website. Michael Debenham (webmaster) is a great grandson of Amanda Southwell (1843–84), the youngest sister of the clan, who married William Elliott Debenham (1839-1924) of Regent Street, another well-known London photographer of the time and brother of two other photographers – Edwin and Arthur. Michael’s wife, Margaret Debenham, has a research interest in the history of this fascinating family. Robert Southwell, Michael’s distant cousin, is a direct descendant of Frederick Southwell’s first union with his partner, Charlotte. So far as we have been able to establish, Robert’s branch is the only surviving line to bear the family name – unless of course any reader knows differently! If so, please do get in touch with us. It is largely thanks to Robert’s assiduous efforts in collecting Southwell Brothers cartes de visite that we are able to present so many images of their work on this site. David Cripps, another distant cousin of Southwell descent, has contributed a great deal of information about the three brothers and their siblings (seven sisters) from his many years of family history research and this is included in our Genealogy section. This is one of our suite of websites, selected for archiving by the British Library.